Iconic fashion photographer Mario Testino has worked with everyone from the Royal Family to Angelina Jolie. He’s the man who caused a sensation with his portraits of Princess Diana in the 90s and has produced a body of work which ranges from leading campaigns and worldwide magazine covers to the official engagement portraits of Prince William and the Duchess of Cambridge and a tombstone coffee table book dedicated to one of his long-term muses, Kate Moss. Now the Peruvian snapper has teamed up with CÎROC Vodka where he’s taken on the role of Creative Director, finding and photographing today’s new star talent. Carefully handpicking newcomers from across the globe, Testino will be documenting their celebratory moments of arrival. What do you think star quality is, and what do you look for in a subject? You just know when someone has it, when someone walks into a room and it’s like the lights go on. I tend to look for something that can’t be measured, like an energy or spirit you just feel when someone walks in to a room. It’s a star quality and it’s true. Something that just radiates from the inside out. Who has been your favourite star to photograph? Every shoot and person, for me, has its own special memory. Every circumstance is different too. I’ve been fortunate to meet and photograph many different types of people too, whether royalty, actors, artists, models or the passerby on the street. It’s very difficult to say as they are all so unique and so memorable in their own way. If I think of some, I would have to say when I first photographed Madonna for Versace in the 1990s. That was a real moment for me because when the campaign came out they printed a page just saying “Versace presents Madonna by Testino”. Photographing Princess Diana too, of course was very memorable and special. Any shoot with Kate Moss and Gisele is always memorable too. If you could choose one person to photograph – past or present – who would it be? I’m always on the look-out for the person I don’t yet know, the person I am yet to photograph. I like the discovery of someone new. It’s one of the most exciting aspects of my job as a photographer. You’ve worked with everyone from the Duke and Duchess of Cambridge to Angelina Jolie, do you find it’s different working with Royal subjects compared to actors? Yes. There is so much history and tradition surrounding royal families I have worked with. It’s quite amazing to be around and experience that. As much as I love the new and the modern I love tradition too, so I have been so fortunate to be around that. You have to respect that. I find a lot of inspiration from Contemporary Art. I travel a lot and I try to make as much time as I can to go to museums and galleries. I find the freedom fine artists have really inspiring. Travel, too, opens my eyes to lots of inspiration. When I was first beginning as a photographer I was working in London but I soon realised that a lot of the work was in Paris or New York or LA, so I decided I would travel to where the work was, and ever since that seems to be my life. What is a typical shoot day like? No two days are the same, that is the beauty of my job. I photograph many different people every day and everyone is completely different. Same too with the place and circumstance. This is what I love and what keeps me doing this after more than 35 years! 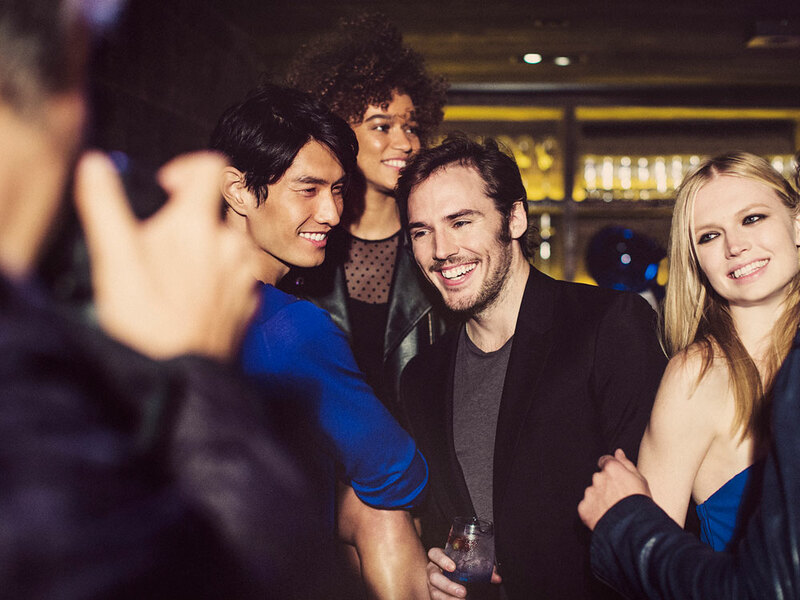 Actor Sam Claflin stars in the first ‘CÎROC On Arrival’ campaign, why was he chosen? With this campaign we are looking to celebrate the latest talents breaking out in their profession. Sam is definitely part of this, a young British actor really making great strides in his career. He’s part of this really exciting generation of young actors, there is an energy about him that is right. How did you collaborate with Sam on the project and concept? Sam was great to work with. We have worked together before so that always helps. We ran through the concept and he was very open to the process. It can be difficult sometimes for actors who might be used to shooting film to then go and shoot for still pictures – it’s a very different thing, though you may not think it. Sam, however, is a pro and can take on any challenge, which is why it worked so well. Which other rising talents are on your radar? You will have to wait and see… We are looking to find people on the cusp of something big, people that really stand out but are not, yet, necessarily famous. I don’t think that is really a pre-requisite for this ‘CÎROC On Arrival’ campaign, but they have to be that person that walks into a room and you just feel their presence. celebrates the latest talent to have made it.